Sleek Aloevera Wax, which is exceptional in hair depilation, owing to the use of aloe vera for making it. Aloe vera is known to act as moisturizer, cleanser and antiseptic for the skin. 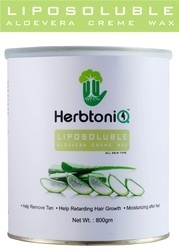 It hydrates and nourishes the skin during hair removal, which prevents rashes from emerging. Banking on our enriched industry experience, we are able to supply Aloe Vera Wax. Estilo aloevera wax gives you smooth and satin-soft skin. It gives excellent results and leaves the skin non-allergic and suitable for firsttime users and for sensitive skins. The NutriGlow Aloe Vera Body Wax Jar includes thick and soft wax for waxing arms and legs (also suitable for men requiring hair removal from the back, legs or chest).